What’s the best location for a chicken coop? Portable eggmobile that can easily be moved about in the field. With a portable coop, you move it to where ever you need it at the time. Make the coop location convenient for you. First, you want the coop close enough that it’s convenient for you to gather eggs and feed, water and care for them each day. So you don’t want it too far from your home. But at the same time, their manure can tend to bring flies, so you also don’t want it too close to your home. I’ve found that the more convenient it is to take care of the chickens, the better I care for them and the more I enjoy them. For Texas, put the coop under some shade. Second, consider what your chickens need in addition to feed and water. In Texas, they need shade during the heat. If you can position them under a tree of any kind that provides shade, that will keep them cooler in the summer. And in Texas, summer is the most difficult time to raise chickens. Put the coop where it will benefit the rest of your farm. In the orchard — If you have fruit trees, not only can they provide shade, but your chickens will get some food by eating the fallen or low-hanging fruit. And they’ll also eat many of the bugs that would otherwise harm your fruit trees. Too, their manure will enrich the soil around the trees. So putting them in your orchard is a good place. They will unmulch your fruit trees, foraging for bugs, so consider using a portable coop / chicken tractor to contain them rather than give them free-range of the entire orchard. In your garden during the off-season — After your tomatoes or other crops are done, move your chickens into that part of your garden. They’ll clean up weed seeds and bugs. They’ll lightly aerate the soil. And they’ll leave manure behind that’ll benefit next season’s crops. A portable shelter is a great way to do this. Or use electric mesh netting as a flexible way to contain them in a particular part of the garden. On your pasture or lawn — This’ll fertilize your pasture, so that the feed you’re paying for does double-duty. I’ve seen a big improvement to our pasture from rotating our chickens through it in mobile, hoop coops. Another approach is to use an eggmobile. The key here is to not leave them in one place too long. I like to move them daily or every few days. This way, the grass gets to rest both from being eaten and trodden down and from their manure. Experiment with the number of chickens, size of coop and frequency with which you move them to get the right balance. You’ll find that it varies somewhat from season to season. 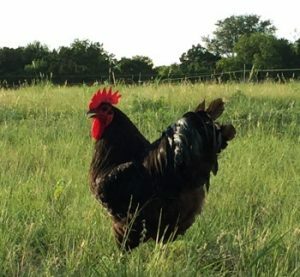 Black Australorp rooster in the pasture. If you’re going to use a stationary coop, ideally position it beneath a large shade tree. And, if possible, use a paddock system or some type of portable fence or run around it so that you can give your chickens access to fresh pasture regularly. Fresh ground is one of the most important things you can do to help them stay healthy. Better yet, use a portable house that you can move around from season to season, or as the needs of your homestead change. Put it in your garden in summer to clean up after spring garden crops have died off. Move it to your pasture during part of the year (or your lawn, which is essentially a small pasture). Move it into your orchard during the early spring before you start to see worms and other pests headed toward your fruit trees. 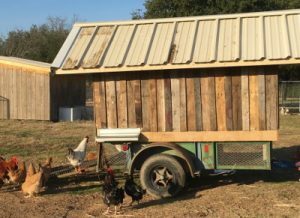 With a portable coop, you don’t really have to decide up front where to put the coop. You move it where you need it at any given time. That’s been, in my experience, one of the best approaches. I just finished building a 10×20 foot chicken run. How many chickens can I put in it? How much space to give your chickens is an important consideration. If chickens are too crowded, they’ll become more susceptible to disease, and they can quickly develop bad habits like pecking. Many resources recommend that you give your chickens at least 2 square feet per bird. When the birds are young, that is adequate, but as they grow up they need more space. I prefer to give each bird at least 4 square feed if they’re going to be confined to a coop. Our hoop coops are 10 feet wide by 20 feet long, or 200 square feet. In them, we start with 100 chicks at 8 weeks old. By the time the birds are 15 weeks old we are keeping only 50 chickens in a coop (4 square feet per bird). Given 4 square feet per bird, the chickens don’t look or act crowded. We use a movable coop that gives our birds access to the grass and soil, so they they can scratch and forage, which is natural to them. We move the coops weekly so that the birds are always on fresh ground. As the days get shorter, your chickens will spend more time inside. It’s important to keep fresh water and feed available. In cold weather, there’s a temptation to close all the doors and windows to keep them warm, but they really need fresh air and adequate ventilation. One approach that can work well is the deep bedding or deep litter system. Basically, you keep a thick layer of high carbon bedding, 8″ or deeper on the floor. This can be dried leaves, sawdust or wood shavings or other similar material. As your chickens drop manure on the bedding and turn it by scratching, the bedding will turn into a living compost pile inside the coop. It will have a clean, earthy smell, and will be quite sanitary. If you start to notice an ammonia smell, then it needs more carbon material added to the bedding. Also, make sure that it doesn’t get too wet. It can tolerate some dampness, but you don’t want it soaking wet.